The manufacturer of our BagasseWare-Wheat line, Bridge-Gate is a leading manufacturer of quality disposables to the foodservice industry. In 2005, Bridge-Gate introduced a premium line of sturdy, oil and grease-resistant dinnerware made from biomass natural fibers as an alternative to polystyrene foam and conventional molded fiber. Bridge-Gate has done all it can to help reduce and eliminate the use of polystyrene foam products. With their large selection of products, including take-out packaging, Bridge-Gate has made sure they are compostable. Products are made with renewable resources such as, organic or waste fibers from harvested wheat. Bridge-Gate packaging, made from natural fiber pulp, is produced with the most environmentally responsible methods in mind. Bridge-Gate starts with raw material in its purest form —the byproduct of agricultural waste — instead of dried pulp sheets from paper mills, which can be very inconsistent. Bridge-Gate strategically located their factory in close proximity to where it is grown and harvested — requiring less fuel for delivery than is typically required to truck pulp sheets from remotely located paper mills. Bridge-Gate pulps the fibers with their exclusive, patented Biopulping method, taking great pride in this zero pollution process which is chemical free, utilizes very little water and has a completely self-contained washing system. Once pulping is complete, the material pumps directly into production of Bridge-Gate finished goods. By eliminating the pulp drying process, less energy and less water is used. Bridge-Gate products are certified by the Biodegradable Products Institute (BPI), which identifies products that meet stringent, scientifically-based specifications for compostability. Bridge-Gate products meet test standards ASTM D6400 and ASTM D6868 and are designed to disintegrate swiftly and safely in a professionally managed composting facility. 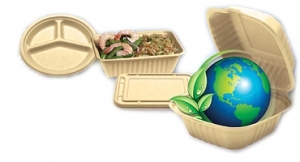 Be assured you will always receive a compostable, consistently high quality foodservice product that has been developed and fabricated with utmost concern for the environment.